What is a Decralite™ grid? Why is cellular PVC a good idea? Stands for "Grill Between the Glass." 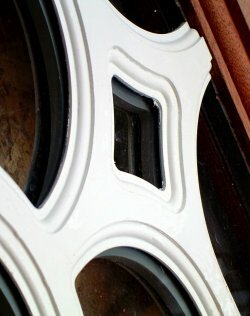 They divide the window sash into lites and are available in ⅞" flat, 1" contoured, or shadow bar. With the grills inside the glass, it makes cleaning the window much easier. Simulated Divided Light. This is done by combining GBG or a Shadow Bar between the glass with a contoured grid affixed to outside of the glass. This simulates the appearance of true divided light with a single pane of glass, lowering overall cost and simplifying maintenance. True Divided Light. This is the traditional method of having a window made out of multiple small panes of glass, separated by a muntin, usually made of wood. Medium Density Fiberboard, an inexpensive alternative to solid wood. Low-E stands for Low Emissivity. Low-E glass has unique features over conventional glass that give it superior performance in energy efficiency. The key to this enhanced performance is a special coating that is applied to the glass. This special coating consists of millions of tiny metallic particles that are uniformly aligned with a specific angle to the glass. This creates an array of tiny mirrors that reflect light and heat away when you don't want it (like during the day in the summer) and lock that same light and heat in when you really need it (like on long winter nights). This allows you to be comfortable in your home at reduced overall energy costs. Low-E glass windows are manufactured with Argon gas injected between the two panes. Argon gas is most commonly used in ordinary incandescent lightbulbs. It is clear, non-toxic, and non-flammable. More importantly, it does not conduct heat as well as air. This enhances the overall efficiency of your window by preventing heat loss in the winter and keeping the heat outside in the summer. The Argon insulation also gives Low-E glass the added benefit of blocking harmful UV light. This practically eliminates the fading and "sun bleaching" that is common for objects near regular clear glass windows. Decralite™ PVC grid systems are a product of Custom Glass Products. These grids are cut out of a solid sheet of cellular PVC using a computer-controlled router for precision. This gives them the unique advantage of having no joints that can come apart once set in between or affixed to the glass. Also, since the grids are created this way, there is a much greater flexibility in the kind of custom grids you can have in your specialty windows. Any shape or design imaginable is possible! When compared to wood, cellular PVC offers superior thermal and structural characteristics. For one, it will never rot and require virtually no maintenance. Cellular PVC is pre-finished, needing no further painting, but can still be painted if you like, and products made with PVC can easily look and feel like their wood counterparts.